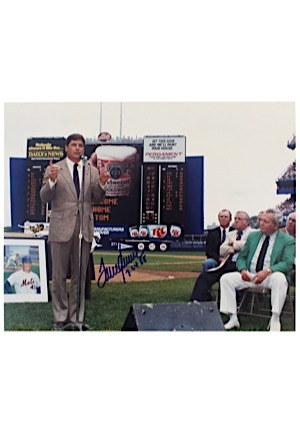 A large 14x11” color photo of Tom Seaver giving his farewell speech at Shea Stadium. Seaver signed the photo in blue marker with the added inscription “7.24.88” and in our opinion the signature rates a 9. Accompanied by a LOA from JSA.